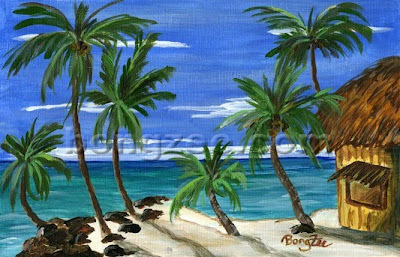 SURF & SAIL THRU SUMMER!!! 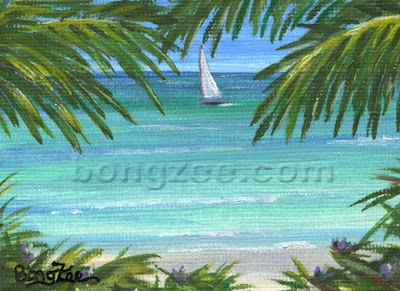 Summer is almost here, and I have surfing and sailing on my mind! 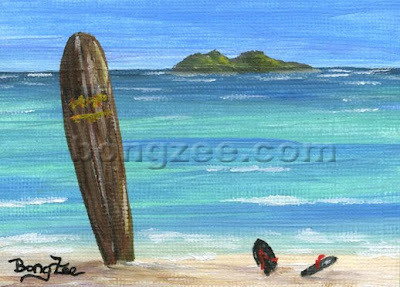 Here are three new original ACEO's with "Surf & Sail" themes. ENJOY! 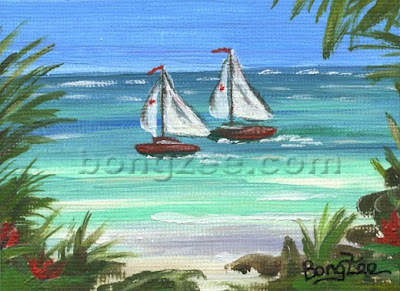 "TWIN SAILS THRU THE TROPICS"
Last week, while driving through the sleepy little town of Waimanalo, I happened to be stuck in a bit of traffic and had a chance to look around more than usual. 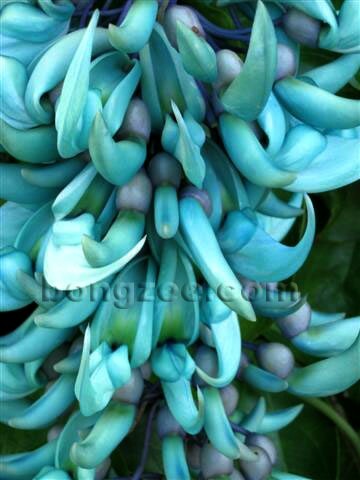 As I was passing "Glenn's Flowers & Plants", a cute little nursery right on the outskirts of Waimanalo - or "NaloTown" as it is locally called, a beautiful teal blue color caught my eye. 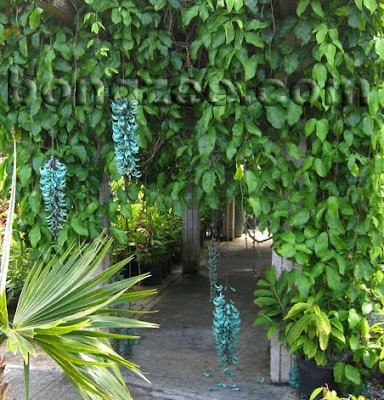 I then noticed that it was a cluster of flowers hanging from a vine-like plant, completely covering a trellis that was set up in the center of the nursery. This flower color was SO UNUSUAL, I thought it must be fake. I had to go and take a closer look. They were real! They were beautiful in color, a deep rich aqua~blue. 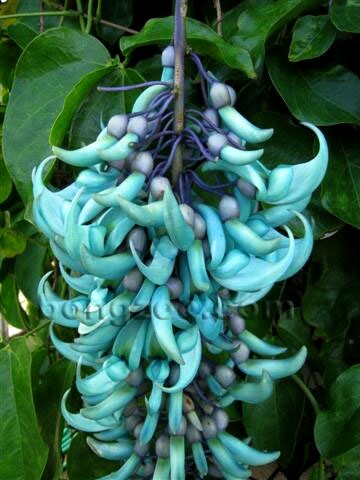 But the shape of these flowers was every bit as unusual as their color, and also a bit "threatening". They resembled a huge birds talons and almost gave me a creepy feeling, despite their gorgeous (and my all time FAVORITE) color. 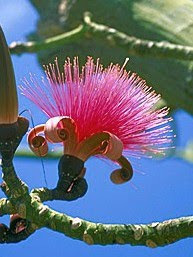 It is a native to the Philippines and grows deep in the rain forest there. She told me they have none for sale, and here in Hawaii, they are hard to propagate, and hard to grow. Oh well... I don't really have any room for such a large hanging vine like this anyways, but it sure made my day to see unusual blue~green flowers like this. And by the time I was ready to leave, their fierce claw-shape didn't seem to offend me any longer. The flowers can be used to make beautiful Hawaiian Leis. 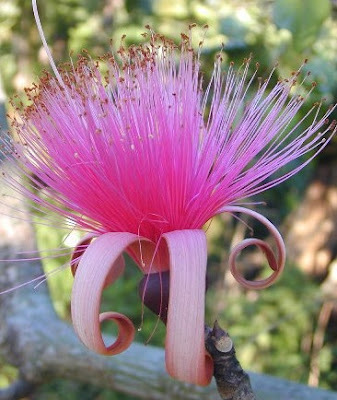 If you are ever in Waimanalo, be sure to check out this gorgeous plant at Glenn's (unfortunately they do not have a website at this time, but if you ask around, anyone in Waimanalo should be able to tell you where to find it). My little yorkie, Brighton, will be happy to show you around "NaloTown"! 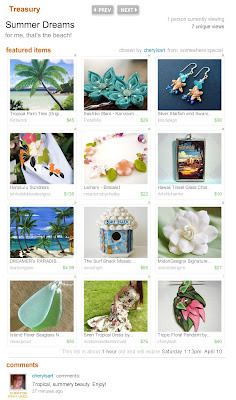 MAHALO to Cheryl's Art for including my "Dreamer's Paradise" Art Magnet in her fun and tropical beachy~themed Treasury. I was determined to find out what type of tree this was, and as luck would have it, the owner of the house came walking up the driveway. “Do you happen to know what type of tree this is?" He did not seem surprised, and must have been asked this question several times before, because he sure had his facts. I listened as he rattled them off. 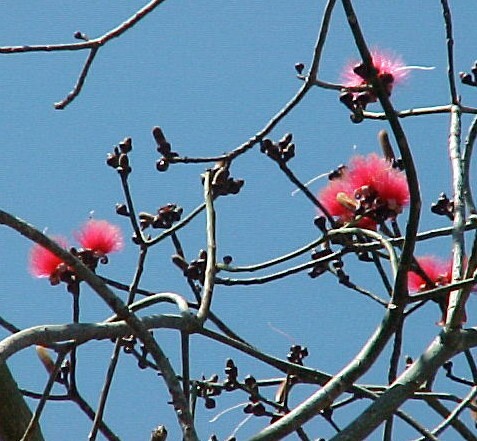 “This is what’s known as a Bombax Tree”. He picked up a blossom off the ground. It looked like something you would dust with! He then went on to say that the wood is very soft and the tree grows quite rapidly. In fact, he was starting to worry about his, as it was planted close to the house and he didn’t want it disturbing the foundation. He also said that the flowers attract a lot of bees. On closer examination of the blossom, you could see small balls of pollen on the tip of each and every strand (stamen) of the flower. He gave me an entire lesson on it’s growing conditions and life cycle. He sure did know a lot about this tree. I think he was very proud of his Bombax! These flowers make beautiful and unusual floral arrangements. And now that I am aware of the Bombax (this variety is known as “Pseudobombax ellipticum" or the “Shaving Brush Tree” – how appropriate!! ), I seem to notice them more and more around the Island, although they are still fairly rare here. After doing some online research, I found that they can be easily propagated from a stem cutting, much like I had done with my “Tahiti Dream” Plumeria Tree. Indead, the actual tree trunk itself did kind of resemble a Plumeria Tree. Hmmm…..... Maybe I will have to give the Bombax a try!